Humic Acid is the most biologically active component of soil humus. In soil, humic acids reduce leaching of essential plant nutrients by chelating (organically bonding) them in the root zone. They also serve as an important carbon based food source from microorganisms vital to soil dynamics, and have buffering effects on soil pH shifts, brought about by natural and artificial factors. In plants, humic acids affect the rapid absorption of nutrients essential to plant health. They also have been shown to improve plant respiration, photosynthesis, and root growth. A preplant root dip containing mycorrhizal fungi, an essential part of all plant growth in natural environments. Myco-Magic innoculates bare-root and containerized perennial plants with beneficial mycorrhizal fungi prior to field planting. Contains 5 species of endo- and ectomycorrhizal fungi that colonize roots of nearly all perennials under broad range of growing conditions. Use it on all plant species except rhododendrons, azaleas, laurels, orchids, and blueberries (product will not damage these plants, but the mycorrhizae will not colonize their roots). Neptune's Harvest Fish (2-4-1) is an organic fertilizer made from fish remains. It is made by unique cold process that protects the vitamins, amino acids, enzymes, and growth hormones. It also contains all the micro and macro nutrients naturally found in fish. The nitrogen and other nutrients are already chelated so they are readily available for plants to consume. Unlike fish emulsions, Neptune's Harvest retains the fish proteins and oils, and has no unpleasant odor. Neptune's Harvest Humate is a liquid humate concentrate that contains vital elements for healthy soil, in an easy to apply liquid form. It provides a wealth of valuable plant elements, holds water in soil, feeds the living organisms in the soil, and releases locked-up nutrients for plant growth. Mix 1 Tbsp per gallon of water for foliar feeding, and 1TBSP per gallon for soil applications. Neptune's Harvest Blend (2-3-1) is a blend of fish and seaweed, which gives you the best of both products, with a perfect blend of fish hydrolyzed and seaweed, ensuring a complete fertilization program. Growers using our fish/seaweed blend increased their marketable yields and improved shelf life on fruits and vegetables. Fish and seaweed are known to build sugars in plants. Flowers and foliage will be stronger and more colorful. Blooms will be more plentiful fragrant, and longer lasting. For best results: Rose & Flowering Formula should be used in combination with Tomato & Veg Formula. Neptune's Seaweed (0-0-1) is an organic supplement which storehouses over 60 naturally occurring majors and minor nutrients and amino acids. It has growth promoting substances, which enhance plant development, color and vigor. It has also been found to increase plant hardiness and resistance to adverse environmental conditions; such as early frost, extreme heat, and lack of moisture. Used as a seed inoculant, seaweed fertilizer increases and accelerates germination, and enhances the rapid development of healthy root systems. Seaweed is an excellent addition to any fertilization program. For best results: Tomato & Veg Formula should be used in combination with Rose & Flowering Formula. SeaCure is an all-natural extract of Ascophyllum nodosum, a seaweed commonly known as rockweed. See the introduction to kelp in the soil amendment section for more information on the benefits of kelp. SeaCure is filtered to avoid clogging fine spray nozzles and is safe to use at any stage of plant growth. It's especially useful as a rooting solution (use 2 tsp./qt. of water) when transplanting seedlings. A pint makes over 30 gallons of spray. The gallon bottle makes over 240 gallons of spray. SeaPlus (3-2-2) is a combination of SeaCure brand liquid kelp and fish emulsion. As a foliar feed in the garden use 3-6 Tbsp./gallon or 1-2 cups/5 gallons. On field crops use up to 1 gallon/A; for tall crops, orchards and turf increase the rate to 1-2 gallons/A. 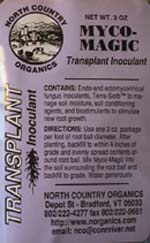 As a transplanting solution, soak the roots and tops in a mixture of 2 cups SeaPlus and 5 gallons water. Stress-X is a soluble extract from Ascophylum nodosum seaweed. Concentrated liquid seaweed extract (reconstituted from Stress-X powder), provides plants with trace elements and natural growth hormones that greatly improve health, growth, and resistance to stress related problems. Stress-X powder reconstitutes into concentrated liquid seaweed, and a relatively small amount goes a long way. 5 gallons conc. (1500 grams of sea extract powder) will treat 2 Acres/year. One small box contains 1500 grams (3.3 pounds) of soluble powder and makes 5 gallons of liquid concentrate. Mix powder with a small amount of warm water to make a slurry first, before adding the total amount of water needed to make the liquid seaweed concentrate. Bio-Magic (0-0-12) is a dry, water-soluble plant growth bio-stimulant with beneficial bacteria(nitrogen-fixing, hormone producing, and phosphorus dissolving). Bio-Magic contains proven growth promoting substance that includes humic extracts (humic acid), cold water, sea kelp extract, essential amino acids, vitamins (B complex and K), root growth factors, and sugars. Bio-Magic is used to promote growth and reduce stress in all types of plants.